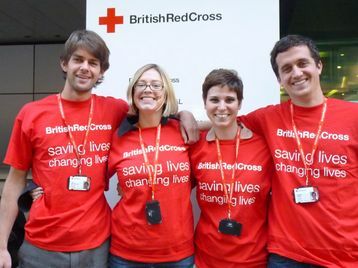 The British Red Cross in South East Wales is looking for compassionate, friendly people to join its volunteering team for services across the region. Anyone interested in volunteering can attend an information event to learn about the services provided by the Red Cross and chat to staff and existing volunteers about the roles available. These events are taking place at the Newport Centre on Tuesday 10May and Cardiff and Vale College on Thursday 12 May. Both events run from 1.30 – 2.30pm. With busy lives it can be hard to find time to volunteer. However, the benefits of volunteering are enormous. It’s not just about what the volunteer can do for others; they can also benefit from the experience. The right volunteering role can help people meet new friends, connect with their community, learn new skills, and provide a huge sense of achievement. Just for a few hours a week. Sixty-four year old Erika Fitzgibbon, from Penarth, has spent a year volunteering with the Red Cross. Part of the Camau Cadarn project (Welsh for ‘Positive Steps’) Erika’s role is to help older people regain their independence. Erika makes regular visits to a person’s home working with them to increase their confidence and encouraging them play a more active role within their community. “I am getting older myself and I’m very aware there are lots of people around with no family, friends or support links. That’s why this service is very important”, explains Erika. Anyone can volunteer. It doesn’t matter what your skills, experience or background are, or how much time you have to give – helping with the smallest task for just a few hours can make a big difference to the lives of those in need. There are numerous volunteering opportunities at the Red Cross. Whether it’s supporting someone through a personal crisis, performing first aid or working in a charity shop, all of voluntary opportunities offer the chance to develop new skills and gain confidence. If you are unable to attend the events but want to find out more about volunteering with the Red Cross, contact VolunteeringWales@redcross.org.uk or call 0300 100 1400 (option 2).